At Bauma 2019, several companies introduced the support of J1939 for their sensors. This included in particular encoders and inclinometers. The Bauma 2019, the largest exhibition of construction machines, also collects the suppliers of electronic equipment. There are many companies offering CAN-connectable sensors including inclinometers, encoders, and length measuring transducers used for hydraulic cylinders. Often such devices comply to CANopen and the CiA profile specifications, e.g. CiA 406 for rotary and linear encoders respectively CiA 410 for inclinometers. Increasingly, these products are also available with a J1939 interface. Unfortunately, no Parameter Groups (PG) for this kind of sensors are standardized. This means, the manufactures are using proprietary PGs. Interoperability with host controllers is not that high and interchangeability of products is not given. Therefore, CiA will submit standardized PGs for such J1939 sensors. ASC, Axiomatic, Curtiss-Wright, Gefran, Kuebler, and Posital exhibited, for example, in Munich tilt sensors with J1939 interfaces. The TSF‑360 by ASC is a digital fluidic sensor. It uses the physical effect that the surface of liquids is always aligned horizontally due to gravity. In contrast to the Mems-based inclinometers, this product has low transverse tilt sensitivity due to the liquid-based measuring principle. The device can measure 360° and is temperature-compensated operating with accuracy of less than ±0,1°. Of course, it comes as most of the inclinometers in an IP67-rated housing. The company also offers capacitive inclinometers. Gefran presented its GIG one/two-axis tilt sensor with J1939 interface and the GIB series with reduced dimensions. They are resistant against shock and vibration. Vehicle and load anti-tipping detection are provided, too. 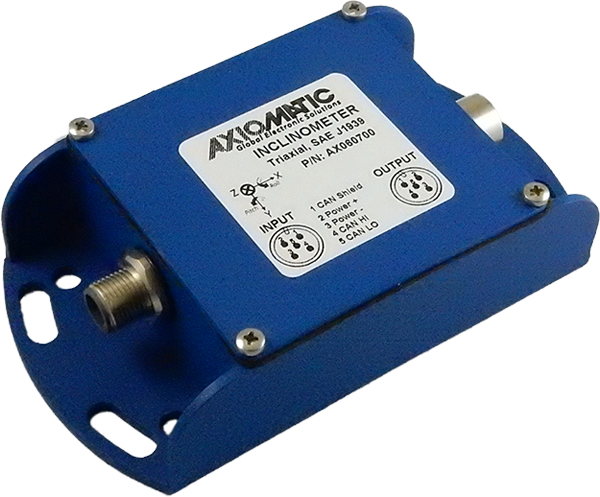 The Italian manufacturer also offers rotary encoders with J1939 interfaces. Kuebler introduced its Sendix M36 magnetic encoders, draw-wire encoders, and IN88 inclinometers with an optional J1939 interface. The approved products provide the same measuring functionality as the CANopen versions. Of course, the supplier customizes the J1939 parameter groups to simplify the integration into the on-board network.